The very first Zelda game that I played was Ocarina of Time. This game is really what sparked my love of Zelda in the first place and impacted my life in a way I would have never imagined. But although the game is important to me in that way and has a lot of great features, it’s not my favorite Zelda game. No, another game released a few years down the line completely stole my heart. This game has a beautiful storyline, amazing graphics, and one of the best video game soundtracks in my opinion, which led to my love of instrumental music and led me to becoming a flute player for the next eight years. Although this may not be everyone’s favorite game, it is for me, and that is why I absolutely love The Wind Waker. Throughout the whole game, I was fascinated by the sea travel, its quirky characters, and how Link earns his place as the Hero of Winds. One of the dungeons from The Wind Waker stood out to me the most, and to this day, this dungeon fills me with childhood nostalgia whenever I go back and play through it. Right from the start, I knew that the Earth Temple was one of the most unique dungeons I have encountered in the Zelda series, and it became one of my favorites. Once I set foot inside the temple, I was immediately intrigued by the darkness that enveloped the whole place and its tribal feel. Looking around the dungeon, I got the feeling that I was about to explore some long-lost tomb of an ancient civilization — and that’s when I noticed the many intricate details inside. The rooms were filled with symbols of the past, tombs that harbor Bubble enemies and Redeads, Dark ChuChus and Moblins roaming the floors, and the lingering Poe spirits haunting the dungeon. Just from these monsters, I realized that the Earth Temple was not only going to present a different adventure, but a whole different world than the rest of the game. As I continued to travel through the rooms of the dungeons, I quickly realized that this temple was not only eerie, but full of evil. The very evil that killed Sage Laruto in cold blood continued to roam about even after her death. With the smell of death and fear in the air, I ventured forward and finally arrived at the room with the giant sun idol. Although this figure was similar to the moon from Majora’s Mask, it was much more horrible. The creepy, skeletal smile with its large and protruding eyes as it loomed over the entrance as though emerging from a sarcophagus made the uneasiness rise within me. But despite the creepiness of the skeletal figure, I began to fondly remember an archaeology museum in my hometown filled with artifacts from ancient Mesoamerica. Most of the symbols and motifs that I had passed through actually reminded me greatly of what the Mayans or Aztecs would have placed in their great temples, and I realized that this dungeon was more than similar to the temples of these civilizations. Due to the number of skulls, grotesque symbols, and monsters pacing around, I believe that this place was possibly used for sacrificial rituals after the arrival and death of the Earth sages. With the overwhelming number of spirits and corpses wandering the dark corners of this place, I think it’s more than possible that there were not only sacrificial rituals but an influence of ancient Mesoamerican culture for this dungeon. 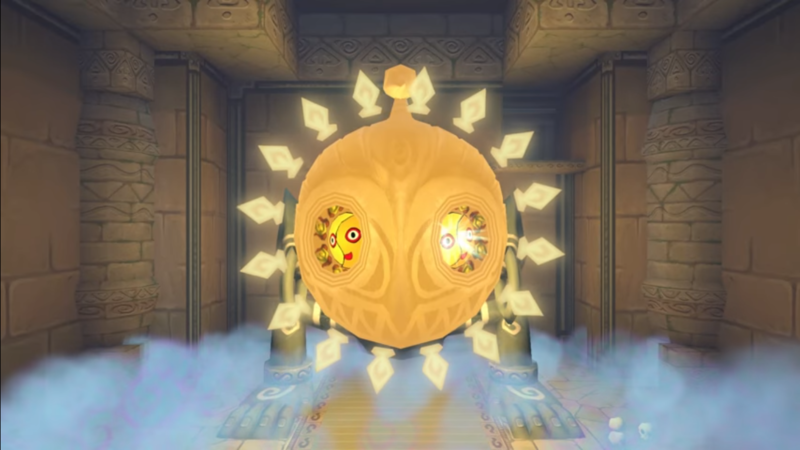 The Readeads in The Wind Waker, with their large earrings, horrible war cries, and body markings resemble a mummified corpse of a tribal member. Even the Stalfos with their long-hair design and pre-historic weapons look very much like a tribal warrior guarding the remains and riches of their kings from any intruders. The temple even descended downwards, as did temples of emperors of ancient tribes in hopes of hiding their body and riches from looters. I was intrigued by this thought and I pressed onward with even more enthusiasm, as it’s my dream to visit the various ruins located throughout Mexico someday. You might even be thinking that this dungeon is similar to the Shadow Temple from Ocarina of Time, but it is actually quite different. 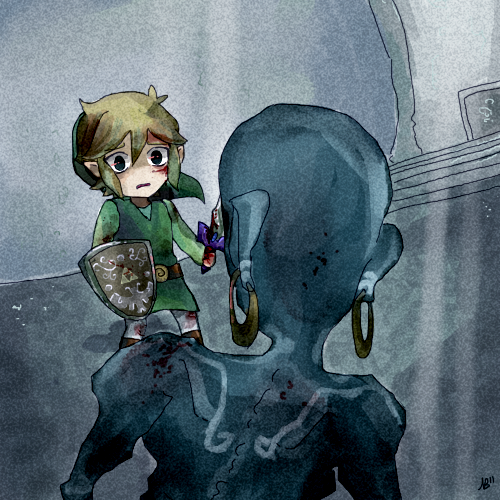 The Shadow Temple is part of the dark history of Hyrule, and I believe the residents of Hyrule wanted to cover up the possible tortures and deaths that occurred in that dungeon and forget it ever existed. On the other hand, the Earth Temple was built before the flooding of Hyrule, and after Ganondorf rose to power again, Laruto’s life ended resulting in the greatest sacrifice ever made in that temple. After she was gone, monsters began to emerge protecting the innermost part of the dungeon from the Hero and they were determined to stop the next Earth Sage from taking over. 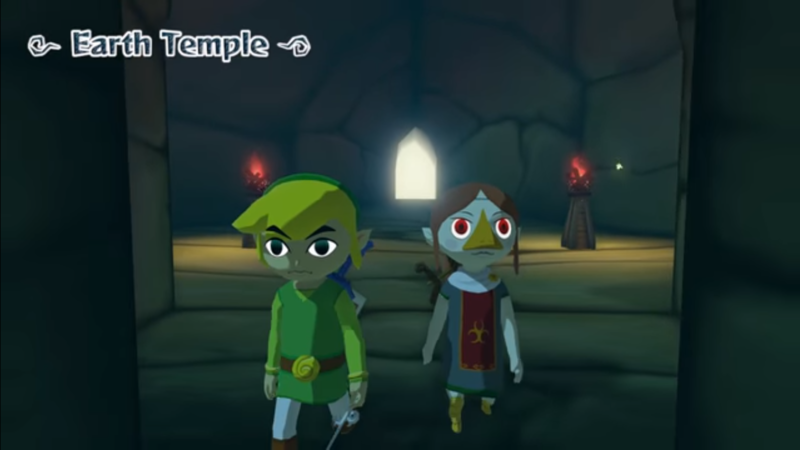 It was then that Medli and Link had to work together in solving the various puzzles and riddles of light and darkness that were set up throughout the temple. I had a lot of fun going through the rooms with Medli using her harp and the Mirror Shield to open doorways, move things around, and even find extra collectibles just because I could. Once I got to the end, however, I was a little disappointed in the final boss, Jalhalla. I was expecting to fight something more pre-historic, like a giant mummified corpse or a large skeletal monster. But I was instead met with a plump Poe, made up of smaller Poes. Though Jalhalla was humorous, I defeated the boss a little underwhelmed, but I was still satisfied I reached my goal. I played the Earth God’s Lyric for Medli and the spirit of Laruto, and together, they helped restore the power of the Master Sword. I was ready to look for the missing pieces of the Triforce. 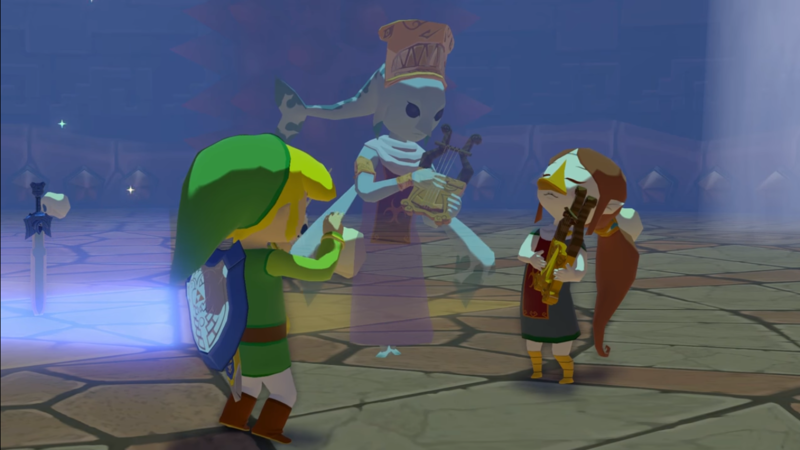 I then had to leave Medli behind and I was a little saddened, but I knew that she had to fulfill her duties as the next Earth Sage so that, with her prayers, the evil would be removed from the large tomb-like dungeon, and the Master Sword would continue to have its power. And so I left the Earth Temple, fascinated by its history and very happy that I got to explore it all. 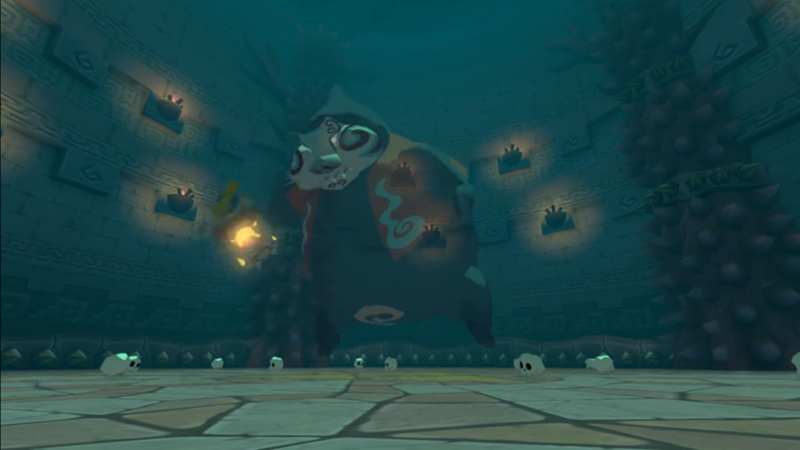 The Wind Waker may not be everyone’s favorite game, nor will the Earth Temple be on top of everyone’s best dungeon list, but it is certainly on mine. 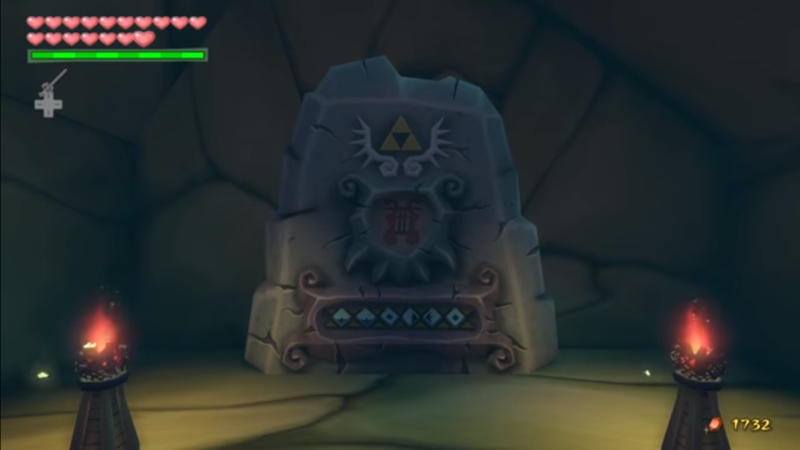 This temple sparked my interest in ancient civilizations, and I continue to be fascinated by the small details I uncover or notice in various Zelda dungeons that could have been influenced by ancient history. This is one of the best dungeons in my opinion, and it does an excellent job in executing its theme. I love this dungeon very much, and though there may be some flaws to it, the Earth Temple holds a very special place in my heart. Michelle is a Senior Editor at Zelda Informer. If you want to check out her immense love for the Harry Potter series, kawaii things, and Rupaul’s Drag Race, you can follow her on Twitter.